Maryland baseball has hired Corey Muscara to be the team’s next pitching coach, the team announced in a press release Monday. Muscara joins a coaching staff led by newly-minted Head Coach Rob Vaughn. He is the third Terps pitching coach in as many years, after Ryan Fecteau left to join former Maryland head coach John Szefc at Virginia Tech earlier this month. 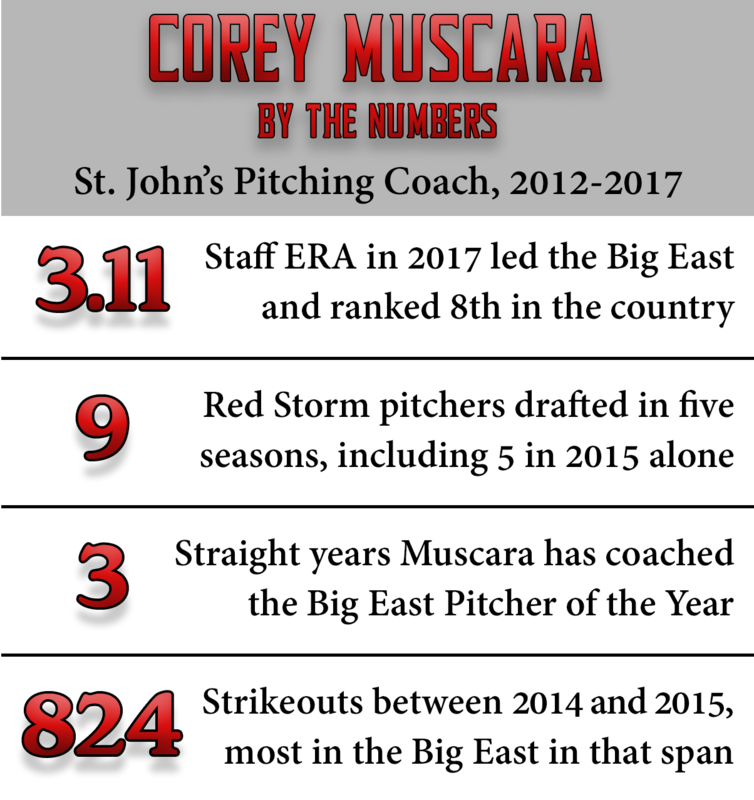 For the last five years, Muscara has served as the pitching coach and recruiting coordinator for St. John’s University. Under his tutelage, a Red Storm hurler has been named Big East Pitcher of the Year for three straight seasons, as right-hander Sean Mooney captured the title this spring. Muscara also led the Red Storm to the Big East ERA title this year with a 3.11 mark that ranked eighth in the country. St. John’s led the conference in strikeouts in two of his five seasons there (2014 and 2015). Over his five seasons at St. John’s, nine of Muscara’s pitchers have been drafted, including Thomas Hackimer (4th round, 123rd overall, 2016 MLB Draft), who in 2016 became the first reliever in more than a decade to win Big East Pitcher of the Year. “The number one thing that I was looking for in hiring a pitching coach was a guy that had a ton of passion for developing young men and had a vision for what this place is going to be,” Vaughn said in a press release. He also noted that Muscara has an excellent resume as a recruiter. Muscara graduated from Franklin Pierce in 2009 after playing two seasons there and two at Siena. After his collegiate career, he coached the Danbury Westerners of the NECBL for two seasons. Prior to his time at St. John’s, Muscara served two stints on the coaching staff at Southern New Hampshire University, in 2010 and 2012, and spent the 2011 season as the pitching coach at Binghamton. At Maryland, he inherits a staff that ranked fourth in the Big Ten in ERA (3.91) and second in strikeouts (479), thanks in part to ace Brian Shaffer, who recently signed with the Arizona Diamondbacks. Muscara will work with a young staff that has lost not only Shaffer, but relievers Ryan Selmer, Jared Price, Jamal Wade, Mike Rescigno and Tayler Stiles. Key remaining arms include starters Tyler Blohm and Taylor Bloom and reliever John Murphy.